For Holden, ME native Braydon Norris ’19 the University of Maine has always been in his backyard. As he prepares for his final semester at the university and in the greater Bangor area he reflects on all of his experiences here. What town or city do you live in when the university is not in session? What is your major (or intended major)? Why did you choose that major and fields of study? The opportunities available to engineers not only in Maine, but worldwide was one of the biggest factors behind my decision to study chemical engineering. I also was fortunate enough to have some amazing teachers at John Bapst Memorial High School who helped push me to learn and pique my interest in math and science. Since my first day at the University of Maine my interest has only grown for this field of study. Why did you choose to attend UMaine? 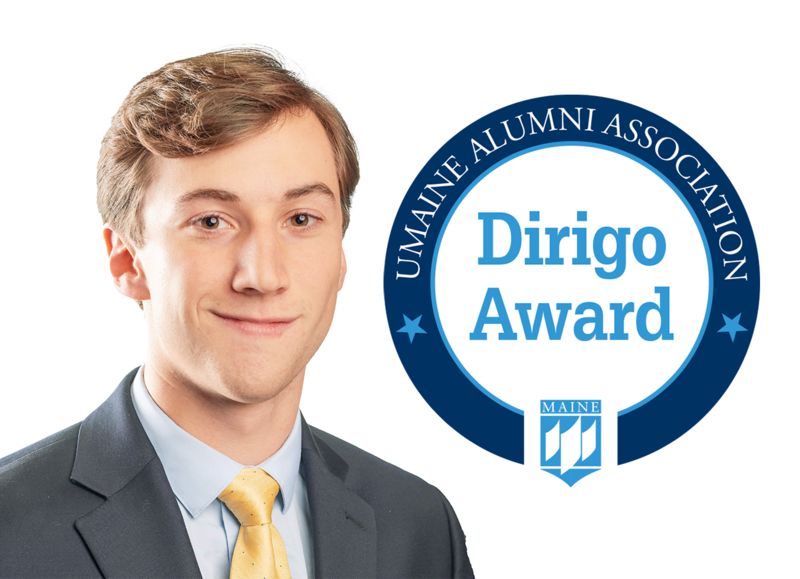 I chose UMaine largely due to its excellent reputation as an engineering school in addition to the large number of scholarship funds available for students willing to work and learn. I grew up in the area and had worked at the university in the summers since my sophomore year in high school, so I was very familiar with the campus and some faculty as well. There is something to be said about being home-grown, as my foundation in education, social network, and experiences has been built with Maine’s strong family and community driven values. What UMaine-affiliated clubs or organizations are you involved in? I am a part of Senior Skulls, Sigma Phi Epsilon, Engineers Without Borders (2015-2017), the American Institute of Chemical Engineers, the Pulp and Paper Foundation, the German Club, the Outing Club, Children’s International Summer Villages, and Soccer Refereeing (from youth to intercollegiate). Favorite place to hang out on campus? I love the William Treat ’40 Room in the Buchanan Alumni House. When it is crunch time, there is no more personally rewarding place to work. Favorite place to hang out off campus? Margarita’s in Orono. They have free chips and salsa, $2 well drinks after 9:00 pm, and great weekday food deals. What is your most memorable event or experience as a UMaine student? It is hard to choose from such a large amount of extremely positive memories of the University of Maine. One of them would be my study abroad during the Fall 2017 semester where I was able to spend the semester studying chemical engineering at the University of Aberdeen in Scotland. I was able to create some lasting friendships and explore Europe’s culture more than any vacation trip ever would have allowed me. I was immediately ingrained in the society and was able to create a second home to which I will definitely return as soon as this upcoming summer. Aside from coursework and campus life, what are your interests or favorite things to do? It depends on the time of year, but my hobbies mostly drive me outdoors whether it is skiing, snowshoeing, hiking, camping, having bon-fires, or playing sports with friends. I also enjoy reading and watching comedies. Who is/are your favorite UMaine professor(s) and what makes them stand out? There are so many excellent professors not only in the Chemical Engineering program at UMaine, but throughout the entire university. The biggest trait they all have in common is their care for the students and the community as a whole which allows the students to really boost their understanding and performance in the classroom. What year do you expect to receive your bachelor’s degree? What are your plans for the year immediately following your UMaine graduation? My friend, who is in med school, and I plan to travel to Europe during the months of May and June. It sounds cliché to backpack across Europe after graduating, and it very well may be, but he and I have quite a few friends across the pond that we plan to visit during our trip. We have a few destinations in mind, and because we have friends in almost every country, we will most likely be doing a loop through Western and Northern Europe. What do you see yourself doing professionally once you’ve finished your education? I was fortunate enough to receive and accept a technical engineering role at Procter and Gamble’s site in Auburn, Maine. This role will allow me to assist and improve the production of a very important product to all of North America, South America, and China – that product is tampons. The Tambrand’s site in Auburn has an excellent culture that has been recognized as Procter and Gamble’s manufacturing site of the year in North America multiple times in the past decade. I hope to work internationally on some level, and I will have the opportunity to do so almost immediately after my start date. One of my co-workers, Aaron Ortiz ’16, was sent to Germany for a weeklong business trip within a couple months of his first day of work. What are the keys to being a successful student at UMaine?